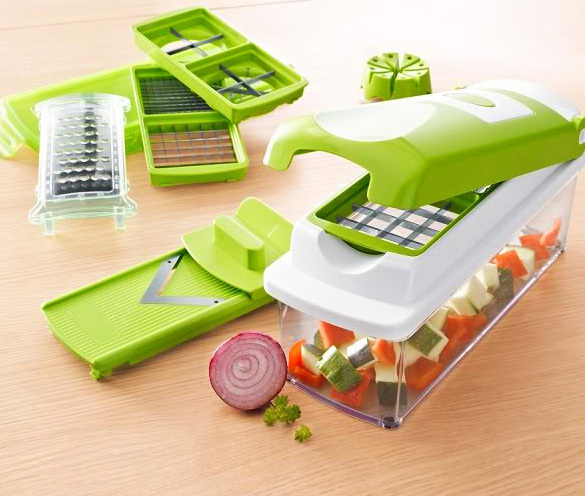 The incredible multi-chopper set is specially designed to save you time in the kitchen! The set has everything you need for cutting, dicing, grating, and slicing! Chop onions, zucchini, peppers, celery, tomatoes, hard boiled eggs, cheese, and fruits--then watch as the ingredients transfer instantly from the cutting surface into the bowl below. It will shorten the cooking time from start of preparation to the serving of the meal tremendously - you have everything in one handy set! Not only does it includes the 1/4", 1/2" and 1" dual chopper blades, it also includes a 4 wedge cutter and an 8 wedge cutter. This terrific set does the job that 4 different products were required to do. The stainless steel Precision cutting blades made easy in one simple step. Simple and space saving as it gets! There's no hassle, and no mess! "This set greatly shortens cooking preparation time, it is truly the perfect kitchen helper for every meal!" 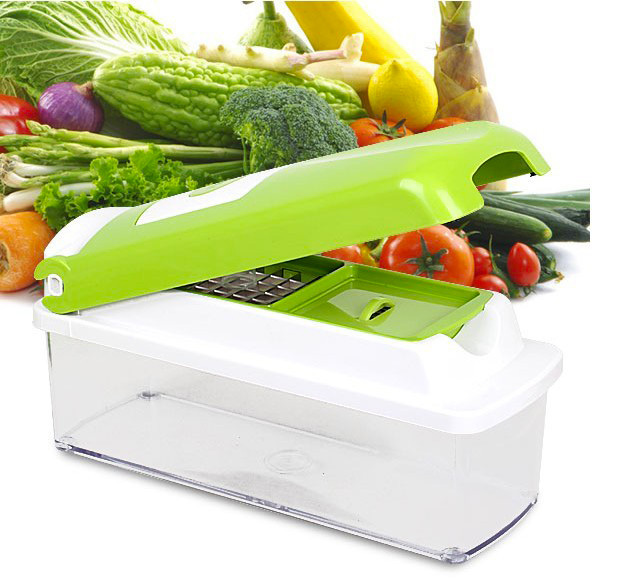 Vegetable Fruit Dicer Slicer Food Processor Cutter 10 PC Set has a rating of 5/5 based on 5 reviews. Great service from you guys. Ordering was easy to navigate and My purchase arrived within days. Would shop with you again. Best thing ever, make salads in 5min flat and potato bake to die for!!!!!!!! I have used this item several times and each time I have put an item through it this cutter has never let me down. The blades are super sharp (careful) and the lid is very sturdy when closing so you feel its not going to break on you. I have prepped fruit salads ,soup veges, eggs etc all super fast even though there is still some cutting involved this is a real time saver. The choice of cutting blades are great there is one for just about anything you choose to dice/slice. I researched other cutters and they did not come even close to this one in value and strength. I would recommend it. Great product to use in the caravan no need for electricity works well and easy to use no need for a food processor. Quick and easy use. Thank you ,all the best! !